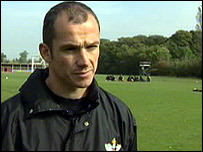 Struggling football club Exeter City FC have unveiled their new manager, former player Eamonn Dolan. He will work alongside former Spurs star Steve Perryman who has been appointed director of football. The club said Dolan, who has been associated with the Grecians for 11 years, turned down a number of opportunities to work at much bigger clubs in order to remain at St James's Park. 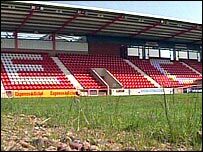 Exeter City, which is reportedly more than £2m in debt, was relegated last season and is fighting court action by creditors. Dolan was previously in charge for one match between the sacking of John Cornforth and the appointment of Neil McNabb last October. He said: "I am as aware as anyone of the problems the club is facing, but have every faith in the ability of the new people at the helm to confront them face on. "We must all work together to get the club back on a sound financial footing and, most importantly of all, winning matches." Perryman's role as director of football will be unpaid. He will work at the club for two days a week and on matchdays. The club's chairman John Russell and vice chairman Mike Lewis have left the club following their arrests in connection with alleged financial irregularities. Both deny the claims. A newly-formed board, created from members of the supporters trust is now in place. Chairman Ian Huxham, said: "Eamonn possesses, in abundance, all the qualities we would be looking for in a manager. "What's more he has Exeter City in his heart and with Steve Perryman at his side, we are convinced the club is in excellent hands."